©2014 Kristen Lippert-Martin (P)2014 Brilliance Audio, all rights reserved. Tabula Rasa starts with an interesting concept - controlling behavior by tampering with the memory of violent offenders or other people who might just be in the way. Unfortunately, the story slides quickly into standard YA tropes - evil doctors and corporate types; unbelievably intrepid, super smart teenagers fighting the system; a lot of teenage angst/anguish and a dopey love story; and contrived conflict during a long and rather tedious takeover of a hospital/lab. Tabula Rasa isn't a hard science sci-fi, but touches on biological sciences and computer science. The biological science isn't bad; we already have a lot of research going on in the study of memory and drugs and techniques that can impact that. However, the computer science here is pretty lame. At one point, one of our intrepid teens hacks into a state of the art encrypted mainframe with a wireless tablet - uh, yeah, right. One other small issue for me; the author makes a big deal about a young male character being much less attractive when he put his glasses on and he had to put his glasses on because his contacts were knocked out. A. No excuse for ugly glasses these days - have you noticed the amazing designer frames out there, Ms. Lippert-Martin?, and B. His contacts were knocked out? Catch up - almost impossible to knock out soft contacts and EVERYONE wears soft contacts. The days of having your contacts knocked out ended about 30 years ago as I can attest having worn contacts for 40 years. Not a big deal, just a personal irritant with this part of the book. 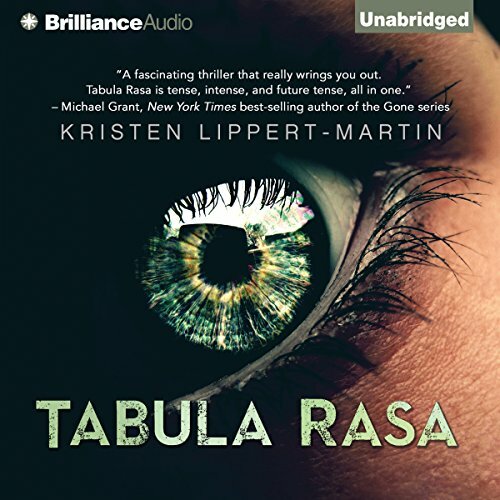 Kate Rudd did a good job with narration and if you loved Hunger Games or Divergent, you might enjoy Tabula Rasa more than I did. Wasn't bad for the sale price, but I wouldn't recommend using a credit on this one. This is an entertaining story if you're able to listen to it all at once, or in big chunks. I listened to it for about 30 mins at a time and I never felt myself being pulled back to listen to more. I did find the story interesting, just not addictive. I liked the plot and did finish the story through to the end because I wanted to know what had happened to the main character. However, I did not like the pace of the story, as there were sections where the plot dragged for me. I would recommend this book to people who need an audiobook for a road trip and who like action and a little bit of suspense. I gave it 3 stars all around because the performance was pretty good, and I liked several of the voices but it would've been better with two narrators. The story as I've said was good but not great. On a whole, average. I got this as a deal of the day and am glad that I didn't spend more than $3 on it... Just didn't keep me coming back for more like other stories have. Loved the characters and the exciting story. Kate Rudd is always amazing. Loved her narration in the "Timebound" series. Great stand alone novel. Okay, not quite hallmark channel, but definitely a romance novel. Good narration. Predictable. Not my cup of tea. Loved this book, action packed and funny! Where does Tabula Rasa rank among all the audiobooks you’ve listened to so far? Tabula Rasa is one of my favorite, listen to over and over again books. What was one of the most memorable moments of Tabula Rasa? The entire book, I was hooked from the start, and curious to figure out what was really going on. Kate Rudd does an excellent job. She is easy to listen to and does great voices. there are a lot of unanswered questions so I am hoping there will be more books to come. even having said that. very interesting. I love kate rudd as the narrator . I could listen to anything she reads!